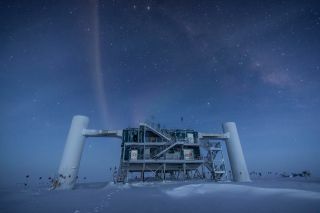 In the icy wasteland of Antarctica sits a massive particle detector, the IceCube Neutrino Observatory. But searching the surface for the instrument will prove difficult, because the bulk of the observatory is trapped beneath the ice. The international observatory has been hunting for neutrinos — massless, chargeless particles that almost never interact with matter. Now, its observations may solve one of the biggest mysteries in astronomy, answering the questions behind the origin of neutrinos and cosmic rays. The IceCube Neutrino Observatory covers one cubic kilometer near the South Pole. The instrument covers a square kilometer of the surface and extends down to 4,920 feet (1,500 meters) deep. It is the first gigaton neutrino detector ever built. While photographs of IceCube often show a building sitting on the snowy surface, the real work is done below. The multipurpose experiment includes a surface array, IceTop, an array of 81 stations that sit above the strings. IceTop serves as a calibration detector for IceCube, as well as detecting air showers from primary cosmic rays, and their flux and composition. The dense inner subdetector, DeepCore, is the powerhouse of the IceCube experiment. Each of the IceTop stations are made up of strings attached to digital optical modules (DOMs) that are deployed on a hexagonal grid spaced 410 feet (125 meters) apart. Each string holds 60 basketball-sized DOMs. Here, deep within the ice, IceCube is able to hunt for neutrinos that come from the sun, from within the Milky Way, and from outside the galaxy. These ghostly particles are connected to cosmic rays, the highest energy particles ever observed. Cosmic rays were first discovered in 1912. The powerful bursts of radiation collide with Earth constantly, streaming in from all parts of the galaxy. Scientists calculated that the charged particles must form in some of the most violent and least understood objects and events in the universe. The explosive stellar death of a star, a supernova, provides one method of creating cosmic rays; the active black holes at the center of galaxies another. Because cosmic rays are made up of charged particles, however, they interact with the magnetic fields of stars and other objects they pass by. The fields warp and shift the path of the cosmic rays, making it impossible for scientists to trace them back to their source. That's where neutrinos come into play. Like cosmic rays, the low-mass particles are thought to form through violence. But because neutrinos have no charge, they pass by magnetic fields without changing their path, traveling in a straight line from their source. "For this reason, the search for the sources of cosmic rays has also become the search for very high energy neutrinos," according to IceCube's website. However, the same characteristics that make neutrinos such good messengers also mean they are difficult to detect. Every second, approximately 100 billion neutrinos pass through one square inch of your body. Most of them come from the sun, and are not energetic enough to be identified by IceCube, but some are likely to have been produced outside of the Milky Way. Spotting neutrinos requires the use of very clear material such as water or ice. When a single neutrino crashes into a proton or neutron inside an atom, the resulting nuclear reaction produces secondary particles that give off a blue light known as Cherenkov radiation. "The neutrinos that we detect are like fingerprints that help us understand the objects and phenomena where the neutrinos are produced," according to the IceCube team. The South Pole may not be outer space, but it brings its own challenges. Engineers began construction on IceCube in 2004, a seven-year project that was completed on schedule in 2010. Construction could only take place for a few months each year, over the Southern Hemisphere's summer, which occurs from November to February. Boring 86 holes required a special type of drill — two of them, actually. The first advanced through the firn, a layer of compacted snow, down to about 164 feet (50 meters). Then a high-pressure hot water drill melted through the ice at speeds of about 2 meters (6.5 feet) per minute, down to the depth of 2,450 meters (8,038 feet, or 1.5 miles). "Together, the two drills were able to consistently produce almost perfect vertical holes ready for deployment of instrumentation at a rate of one hole every two days," according to IceCube. The strings then had to be quickly deployed into the melted water before the ice refroze. Freezing took a few weeks to stabilize, after which the instruments remained untouchable, permanently frozen in the ice and unable to be repaired. The failure rate of the instruments has been extremely slow, with fewer than 100 of the 5,500 sensors currently nonoperational. IceCube began making observations from the start, even while other strings were being deployed. When the project first began, researchers were unclear about how far light would travel through the ice, according to Halzen. With that information well established, the collaboration is working towards IceCube-Gen2. The upgraded observatory would add approximately 80 more detector strings, while the understanding of the properties of ice will allow researchers to place the sensors more widely apart than their original conservative estimates. IceCube-Gen2 should double the size of the observatory for roughly the same cost. An IceCube sensor, attached to a "string," descends into a bore hole in the Antarctic ice. IceCube began hunting for neutrinos before it was completed, producing several intriguing scientific results along the way. Between May 2010 and May 2012, IceCube observed 28 very high-energy particles. Halzen attributed the detector's ability to observe these extreme events to the completion of the detector. "This is the first indication of very high-energy neutrinos coming from outside our solar system, with energies more than one million times those observed in 1987 in connection with a supernova seen in the Large Magellanic Cloud," says Halzen said in a statement. "It is gratifying to finally see what we have been looking for. This is the dawn of a new age of astronomy." In April 2012, a pair of high energy neutrinos were detected and nicknamed Bert and Ernie, after the characters from the children's television show "Sesame Street." With energies above 1 petaelectronvolt (PeV), the pair were the first definitively detected neutrinos from outside the solar system since the 1987 supernova. "It is a major breakthrough," said Uli Katz, a particle physicist at University of Erlangen-Nuremberg, in Germany, who was not involved with the research. "I think it is one of the absolute major discoveries in astro-particle physics," Katz told Space.com. These observations resulted in IceCube being awarded the Physics World 2013 Breakthrough of the Year. Another major payoff came on December 4, 2012, when the observatory detected an event that the scientists called Big Bird, also from "Sesame Street." Big Bird was a neutrino with an energy exceeding 2 quadrillion electron volts, more than a million million times greater than the energy of a dental X-ray, packed into a single particle with less than a millionth of a mass of an electron. At the time, it was the highest-energy neutrino ever detected; as of 2018, it still ranks second. With the help of NASA's Fermi Gamma-ray Space telescope, scientists tied Big Bird to the highly energetic outburst of a blazar known as PKS B1424-418. Blazars are powered by supermassive black holes at the center of a galaxy. As the black hole gobbles down material, some of the material is deflected into jets carrying so much energy they outshine the stars in the galaxy. The jets accelerate matter, creating neutrinos and the fragments of atoms that create some cosmic rays. Starting in the summer of 2012, the blazar shone between 15 and 30 times brighter in gamma rays than its average before the eruption. A long-term observation program named TANAMI, which routinely monitored nearly 100 active galaxies in the southern sky, revealed that the core of the galaxy's jet had brightened four times between 2011 and 2013. "No other of our galaxies observed by TANAMI over the life of the program has exhibited such a dramatic change," Eduardo Ros, from the Max Planck Institute for Radio Astronomy (MPIfR) in Germany, said in a 2016 statement. The team calculated that the two events were linked. "Taking into account all of the observations, the blazar seems to have had means, motive and opportunity to fire off the Big Bird neutrino, which makes it our prime suspect," said Matthias Kadler, a professor of astrophysics at the University of Würzburg in Germany." In July 2018, IceCube announced that, for the first time, it had tracked neutrinos back to their source blazar. In September 2017, thanks to a newly installed alert system that broadcast to scientists around the world within minutes of detecting a strong neutrino candidate, researchers were able to quickly turn their telescopes in the direction that the new signal originated. Fermi alerted researchers to the presence of an active blazar, known as TXS-0506+056, in the same part of the sky. New observations confirmed that the blazar was flaring, emitting brighter-than-usual bursts of energy. For the most part, TXS is a typical blazar; it's one of the 100 brightest blazars detected by Fermi. However, while the 99 others are also bright, they haven't hurled neutrinos toward IceCube. In recent months, TXS has been flaring, brightening and dimming as much as a hundred times stronger than in previous years. "Tracking that high-energy neutrino detected by IceCube back to TXS 0506+056 makes this the first time we've been able to identify a specific object as the probable source of such a high-energy neutrino," Gregory Sivakoff, of the University of Alberta in Canada, said in a statement. IceCube isn't finished yet. The new alert system will keep astronomers on their toes in future years. The observatory has a planned lifetime of 20 years, so there's at least another decade of incredible discoveries coming from the South Pole observatory.